In 1937 MGM decided to start its very own studio, after having distributed cartoons by Ub Iwerks (1930-1934) and Harman-Ising. They put Fred Quimby, a producer famous for having neither animation experience nor any sense of humor, in charge. Quimby hired virtually Harman & Ising’s complete staff away. He also hired some talent from other studios, most notably Jack Zander and Joe Barbera, who would later work on Tom & Jerry, and Friz Freleng. Quimby lured Freleng away from Leon Schlesinger by flattery and by offering him a much larger salary. Freleng stayed less than a year at MGM before happily returning to Warner Bros.
Freleng’s talents were wasted on ‘The Captain and the Kids’, a series based on the classic comic strip of the same name by Rudolph Dirks. MGM had bought the rights to this comic strip, and insisted to make a series out of them. The strip had been around since 1897 (first as ‘The Katzenjammer Kids’), and really felt as coming from another era. Amidst the days of Donald Duck, Daffy Duck and Popeye, these characters were hopelessly old-fashioned, and Freleng struggled to create any fun with them. Consequently, none of the Captain and the Kids cartoons have become classics. Nevertheless, Freleng’s films were still better than that of other people directing the ill-conceived series, which was, in the end, a failure. In total, Freleng directed six Captain and the Kids cartoons, and one stand-alone cartoon called ‘The Bookworm’, before returning to the greener pastures of the Leon Schlesinger studio. 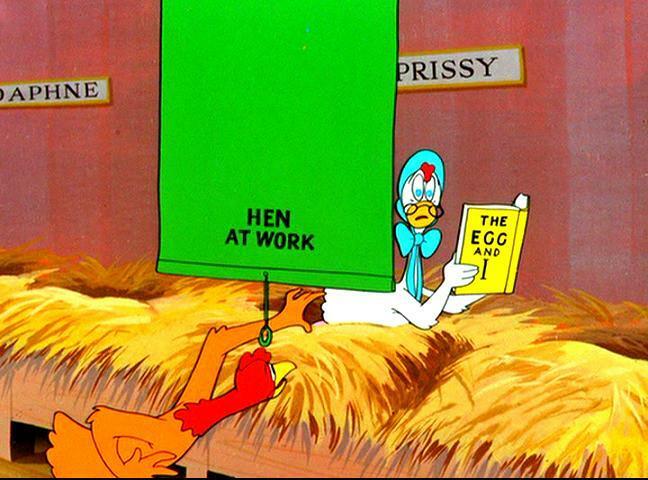 Of Freleng’s Captain and the Kids cartoons, ‘Poultry Pirates’ is the first. It stars the captain, only, who tries to keep a bunch of chickens and ducks out of his vegetable garden, to no avail. At one point he has to fight a six feet tall rooster, but that happens to be part of a dream. There’s very little to enjoy in ‘Poultry Pirates’. The animators do no attempts to lip synch, neither the captain nor the chicks gain and sympathy, the story drags on, and the result is frustratingly unfunny. 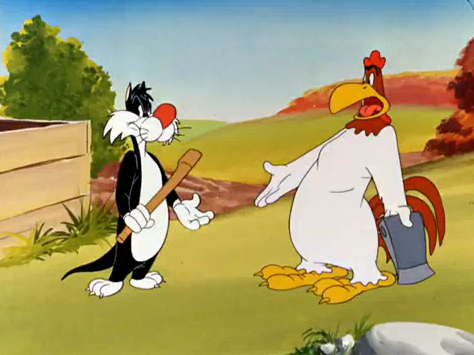 ‘Crowing Pains’ is Foghorn Leghorn’s second cartoon, and it immediately starts where the first (‘Walky Talky Hawky‘, from the previous year) left off: Henery Hawk wants to catch a chicken, and Foghorn Leghorn tricks him by pointing out somebody else as a chicken. This time it’s Sylvester, in an early appearance. 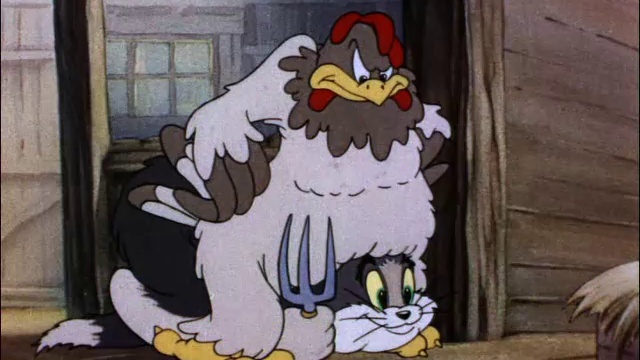 The cartoon is full of Warren Foster-penned nonsense, but the interplay between the four characters (the barnyard dog is also involved) doesn’t develop very well, and seems an early forerunner of the odd pairings of characters of some Warner Brothers cartoons from the 1960s. 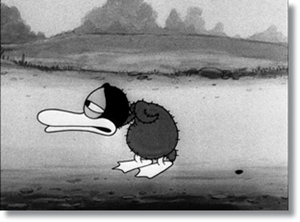 Unlike those, however, ‘Crowing Pains’ remains an enjoyable cartoon, albeit not among McKimson’s most inspired shorts.